The best entrepreneurs balance brilliant business ideas with a rigorous commitment to serving their customers' needs. 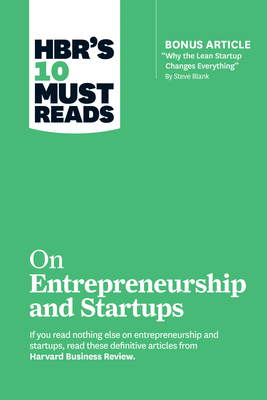 If you read nothing else on entrepreneurship and startups, read these 10 articles by experts in the field. We've combed through hundreds of articles in the Harvard Business Review archive and selected the most important ones to help you build your company for enduring success. This collection of articles includes "Hiring an Entrepreneurial Leader," by Timothy Butler; "How to Write a Great Business Plan," by William A. Sahlman; "Why the Lean Start-Up Changes Everything," by Steve Blank; "The President of SRI Ventures on Bringing Siri to Life," by Norman Winarsky; "In Search of the Next Big Thing," an interview with Marc Andreessen by Adi Ignatius; "Six Myths About Venture Capitalists," by Diane Mulcahy; "Chobani's Founder on Growing a Start-Up Without Outside Investors," by Hamdi Ulukaya; "Network Effects Aren't Enough," by Andrei Hagiu and Simon Rothman; "Blitzscaling," an interview with Reid Hoffman by Tim Sullivan; "Buying Your Way into Entrepreneurship," by Richard S. Ruback and Royce Yudkoff; and "The Founder's Dilemma," by Noam Wasserman.